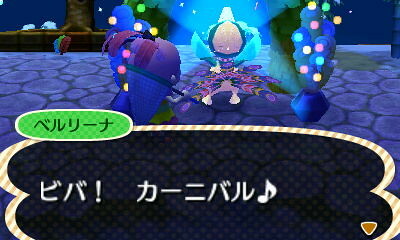 On 3/11/13, Wasabi Village celebrated their first “major” holiday called Festivale. Mayor Neko has deemed Festivale to be a major holiday because it is an event that takes over the entire town, and there is a special furniture series called the Pavé Series which can only be obtained during this time. A special guest visitor named Pavé the Peacock can be found dancing at the Town Plaza. 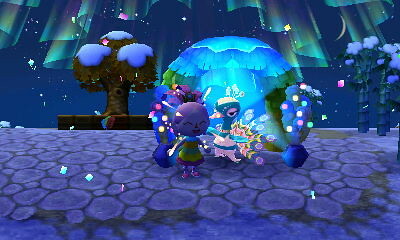 All of the villagers are encouraged to dress up for the event as well, and confetti is floating through the air at all times on this day. 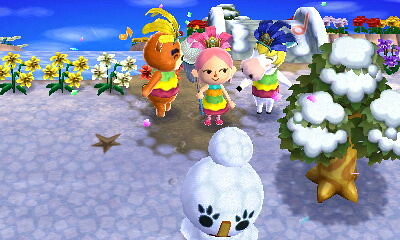 For those who want to join in on dressing up, all Festivale themed clothing items are on sale at the Able Sisters Shop. The main objective of Festivale (other than to dance and have fun, of course!) is to collect the Pavé Series. 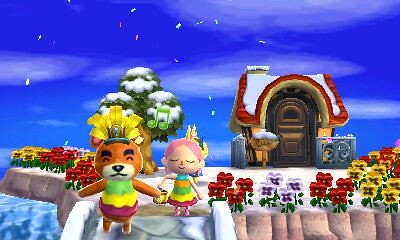 This is somewhat similar to the Festivale holiday celebrated in Animal Crossing: City Folk, but there is a new twist. 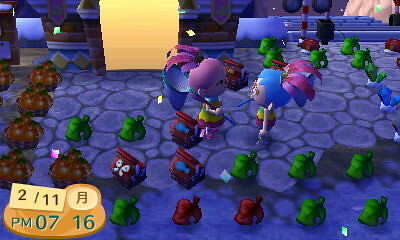 In ACCF, you had to hoard loads of different colored candy to exchange with Pavé to receive the furniture items. It was a long process, as it was very difficult to be sure you had enough of each color candy, so you would have to play mini-games with the villagers to get the candy you needed. If you are lucky, you catch the colored feathers that you need and exchange three for one furniture item. However, it’s very rarely that simple. Thankfully, villagers in town will help you. If you have a feather in your pocket and you approach a townie, there are a couple of things that could happen. They could either ask for a trade of one of your feathers for one of theirs, or they can offer to play “Rock, Paper, Scissors”, or some other mini-game involving choosing one of four choices. (Due to the language barrier, Mayor Neko was unclear on what goes on in that last mini-game.) Keep in mind – if you win, you can get another feather, but if you lose a mini-game to one of the townies, you lose a feather! Before I started worrying about talking to my townies, I walked all over town (watering my flowers as usual) and collected as many feathers as I could find. When my pockets were full, I took all the feathers I’d snatched and dropped them in the Town Plaza by Pavé. I organized the feathers by color. 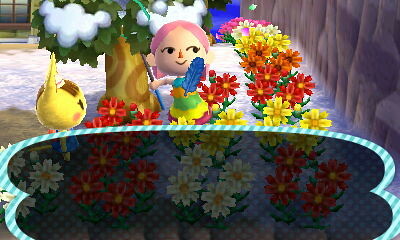 Since I knew I would need three of any color to exchange for an item, I left at least three of each color at the Plaza. I talked to Pavé to see which color feather he wanted. If I already had it gathered up at the Town Plaza, great! If not, I’d count to see how many more of that color I needed, and then I would gather any spares of any color (leftover feathers after I’d already grouped three together at the Plaza) and start walking the town. 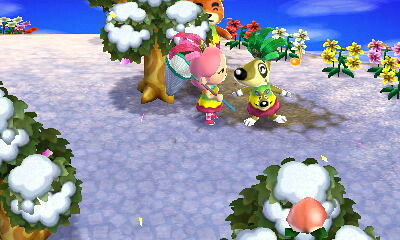 With spare feathers in my pockets, I’d approach a villager. More often than not, I’d get lucky and the townie would simply ask for a trade and would give me the color feather I needed. However, if they asked to play a mini-game instead, then my feathers are at risk to be lost, so this is why I recommend only using spare feathers when talking to villagers around town. 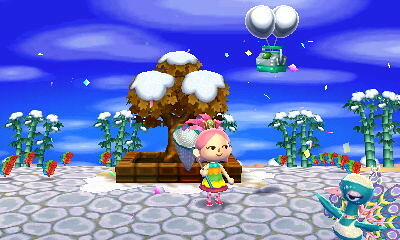 Once I’d received a feather that I needed, I’d stop talking to the townies and run straight back to the Plaza. I did this to ensure that I would not accidentally talk to a townie and risk losing the color feather that I’d just obtained. After dropping off my feather at the Plaza, I’d re-count and see if I had enough. If not, it was back to picking spares and talking to the villagers in hopes of an exchange. It seems to me that this event somewhat takes pity on you – most likely if I needed a pink feather, the townies would say, “Oh you have a green feather – want to trade it for my pink feather?” Or maybe the townies were just really nice to me. I can’t be sure. Don’t bother talking to the townies if you have no feathers in your pockets. (Other than to be social, of course.) If you don’t have any feathers, the townies will not engage in a mini-game or a trade. If you are out of spares, resume trying to find floating feathers again. If you don’t seem to see any floating feathers in the air, I recommend checking the beach. Like snowflakes, feathers tend to gather down at the beach. I’d usually find at least two feathers down at the beach at any given time. Oooh pretty rainbow colored text! (Well, only four colors. Still cool though.) Then Pavé does a very special dance during which he throws his head back and spins around. Here are some photos to give you a small glimpse. Pavé does not give you anything special for the rainbow feather, just another item from the Pavé Series. 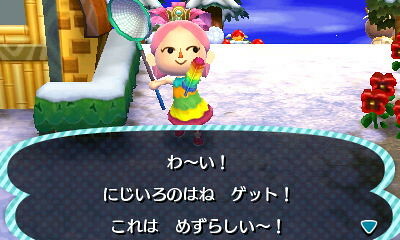 However, you only have to give one single rainbow feather for an item, rather than three. It’s worth it just to see the dance. It is unclear if Mayor Neko misread the details on Festivale, because as you can see from these photos, the event was going on well into the night. Originally it was thought that the Festivale event was only going to be held from 6am – 6pm. 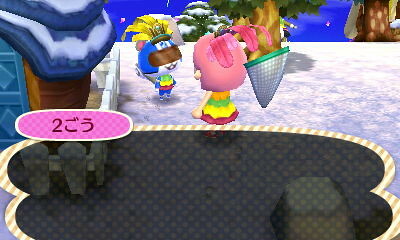 Mayor Neko was seen catching feathers and doing exchanges with Pavé as late as 10:45pm. Mayor Neko seems to think that the hours were changed because she didn’t approve of the scheduled time, but Shizue has hinted that the reason Festivale lasted so long might have been because the town ordinance is set for late night hours. Or the original info Mayor Neko had read could have been wrong! Shizue has promised to do some research and have more information on the time discrepancy by the time Issue #3 of the Wasabi News goes to print. All in all, Festivale is a very entertaining holiday where townies look ridiculous, everyone is whistling the town tune, and it makes you want to learn to samba. 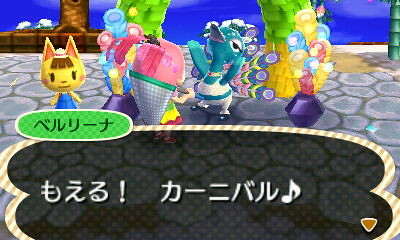 Mayor Neko would also like to add that Festivale really helped her learn the words for different colors in Japanese – so that’s a bonus! In addition, any spare items from the Pavé Series can be sold at the Recycling Shop for ฿12,000, which makes it worth it to play all day and collect as many items as possible. Teddy doing the samba on a bridge! Kitt is strutting her stuff! Sandwich dance with Mayor Neko?? Quick stop over at Orantoiro! 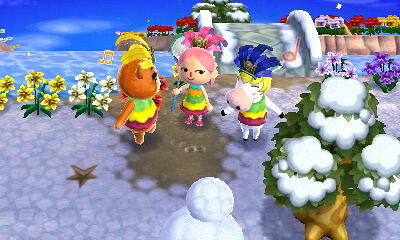 Agent S wins the award for looking the most ridiculous in her samba shirt and headdress! 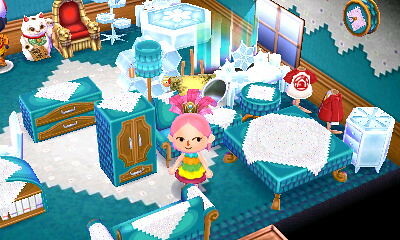 Almost the entire Pave Series (minus the bed) shoved into Mayor Neko’s Ice Room.